Civil building and planning is the gist of what Topocad is aimed for. Topocad is the link between the reality and the drawing, or vice versa, the map and reality. Data capture methods in Topocad are several. 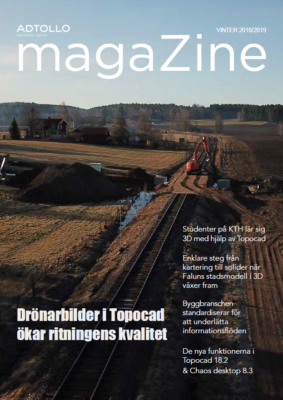 Measuring with total station, GPS or levels create data in Topocad. Photogrammetric capture by using the link to EspaCity. The import of data from CAD systems, GIS, or other computing systems. All data capture helps to create a map or drawing, data is stored in a drawing or one or more databases. From these data we create new data for stake out, for machine guidance or web. The geographic data we have is edited, disposed of and built. Of these, we create new construction maps, site plans, cadastral maps, as-built drawings, 3D models, and more. Data Processing where we use our geographic data to build the next stage of the process – the planning and design stage. Many different types of plans are created in Topocad where we have a special support for the detail plans. Designing likewise, sewer and road design, and design for civil engineering and building construction. Topocad is a tool acting in the glue between the map and the reality. All to create good communities.